Get the current state of HaloCode&apos;s button. The returned result is True: the button is pressed; False: the button is not pressed. Get the current state of touchpad0. The returned result is True: touchpad0 is touched; False: touchpad0 is not touched. If touchpad0 is touched, this function can obtain the strength of the touching. The value range is 0-10000.
val Percentage change of the touching; value greater than the threshold means being touched; the value range is 0-1. Get the current state of touchpad1. The returned result is True: touchpad1 is touched; False: touchpad1 is not touched. If touchpad1 is touched, this function can obtain the strength of the touching. The value range is 0-10000. Get the current state of touchpad2. The returned result is True: touchpad2 is touched; False: touchpad2 is not touched. If touchpad2 is touched, this function can obtain the strength of the touching. The value range is 0-10000. Get the current state of touchpad3. The returned result is True: touchpad3 is touched; False: touchpad3 is not touched. If touchpad3 is touched, this function can obtain the strength of the touching. The value range is 0-10000. Get the current state of the pin. The returned result is True: the pin is touched; False: the pin is not touched. Obtain the strength of the touching. The value range is 0-10000.
val Percentage change of the touching; value greater than the threshold means being touched; the value range is 0.0-1. Read digital input of the pin. The value is 0 or 1.
val The value is 0 or 1.
val The value range is 0-1023. Read PWM input. The value range is 0-3300, measured in mv. val The angle of turning, the value range is 0-19999. When the value is less than 544, the result is to set the angle: if the input value is less than 0, the returned result is 0; if the the value is greater than 180, the returned result is 180. When the value is greater than or equals 544, the result is to set the length of the pulse, measured in us; the maximum value is 19999 us, nearly 20ms. val The value is 0.0 or 1. 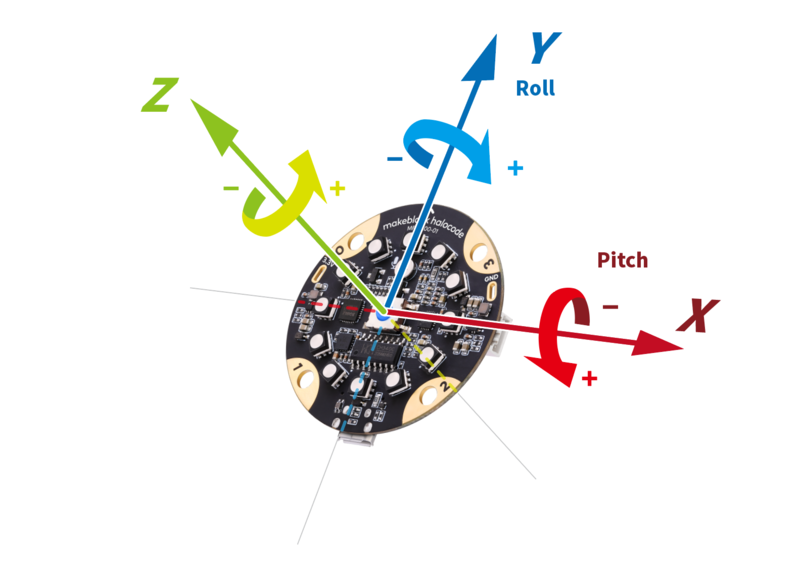 Both roll and pitch are 0° when HaloCode is horizontally placed. Get the yaw of the Euler angle, The returned data range is 0 ~ 360. 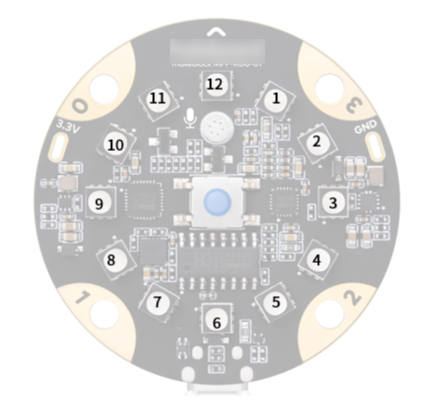 Since HaloCode&apos;s onboard sensor does not have electronic compass. So in fact the yaw angle is just the integral of the Z-axis angular velocity. It has accumulated errors. If you want to get a true yaw angle, this API is not suitable for use. axis String type, with x, y, z representing the axis defined by HaloCode. axis string type, with x, y, z representing the axis defined by HaloCode, and all representing all three axes. This is also the default value for this function. Check if HaloCode is tilted to the left (threshold value is 15°), and the return value is a Boolean value, where True means that HaloCode is tilted to the left, and False means that HaloCode is not tilted to the left. Check if HaloCode is tilted to the right (threshold value is 15°), and the return value is a Boolean value, where True means that HaloCode is tilted to the right, and False means that HaloCode is not tilted to the right. Check if HaloCode is positioned arrow-up, and the return value is a Boolean value, where True means that HaloCode is positioned arrow-up, and False means that the HaloCode is not positioned arrow-up. Check if HaloCode is positioned arrow-down, and the return value is a Boolean value, where True means that HaloCode is positioned arrow-down, and False means that the HaloCode is not positioned arrow-down. Check if HaloCode is shaken, and the return value is a Boolean value, where True means that HaloCode is shaken, and False means that HaloCode is not shaken. If HaloCode is shaken, this function can obtain the intensity of the shaking. The value of the return value range is 0 ~ 100. The larger the value, the greater the intensity of the shaking. led_id The id of one single LEd, the value range is 1-12.
color_str String type, the format is "color1 color2 color3 color4"; "colorx" means "red"/"green"/"blue"/"yellow"/"cyan"/"purple"/"white"/"orange"/"black"/"gray"; over 12 colors will automatically be cut to 12.
offset The value range is 0-12.
percentage The value range is 0-100.
name The four default LED animations: spoondrift, meteor, rainbow, and firefly. Check if the LED ring is positioned face-up. The return value is True: the LED ring is positioned face-up; False: the LED ring is not positioned face-up. Check if the LED ring is positioned face-down. The return value is True: the LED ring is positioned face-down; False: the LED ring is not positioned face-down. type String type: average, to get the average loudness over a certain period of time; maximum, to get the maximum loudness over a certain period of time; the value rang is 0-100.
server Speech recognition server, the default server SERVER_MICROSOFT, powered by Microsoft. language The language of recognition: LAN_CHINESE, Chinese; LAN_ENGLISH, English. time The duration of speech recognition, the default value is 3 seconds. Report specific error message, string type. Report recognition results, string type; return empty string when there is an error or a timeout condition. Report the single identification of voice data, generated by the server. Report the results of speech recognition, including all returned messages, like error message. Check if Wi-Fi is connected, the return value is Boolean, where True means that Wi-Fi has established a connection, False means that Wi-Fi has not yet established a connection. topic_head Prefix directory of cloud message topic. client_id The single client ID when connecting to proxy server; a random id will be generated when the string is empty or left unset, where the parameter clean_session of connect should be True. server Server name or IP address of remote server. *port* (optional) The port of the server to connect to; the default port is 1883. *user*_ (optional) The registered user name on the server. *password* (optional) The registered password on the server. *keepalive* (optional) Client&apos;s keep-alive value, default 60 seconds. *ssl* (optional) Choose to support SSL/TLS. Note: parameters other than callback need to be included. message String type, name of the cloud message. message String type, name of the mesh message. Get current value of the timer, measured in second. value The value of the variable. message_str String type, the message to broadcast.